For teens aged 12-16, they will pick up the Guitar and learn basic chords and strumming patterns, simple grooves that you hear every day on the Drums, chord progressions on Keyboard and expand their vocal range in the Voice program. • Lessons are 480 min. per week group sessions. i) Wishes to explore a variety of instruments including Vocal, Drums, Guitar, Keyboard. We accept registrations from ages 12-16 years old only. 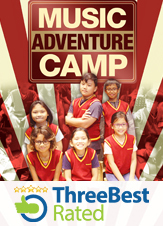 Please click here for Music Adventure Camp for 8-11 year olds. More than just music, your children will learn to develop their social skills, natural ability to pick up a new skill and self-confidence as they perform as a group. Following Believer Music’s systematic and award-winning syllabus, they will also learn to play ALL four instruments (Voice, Drums, Guitar, Keyboard) for real over the 2 days.